Sedgeley Park M25 Deep Rug & Carpet Cleaning Services | Quality Property Care Ltd. Hiring a professional rug and carpet cleaning company, and using its services routinely is a very good plan, especially if you or somebody in your household suffers from pollen or dust allergies or has respiratory problems. The quantities of dust mites, dirt, dust and germs in our carpets are actually quite shocking, so don’t hesitate to hire Quality Property Care Ltd., which offers a top quality rug and carpet cleaning service in Sedgeley Park M25 and the area. The rug and carpet cleaning company can also offer: blinds cleaning, curtain cleaning, drapery cleaning, as well as mattress cleaning and bed bug mattress treatment, which will help remove the dust mites, allergens and kill off all germs. The business provides commercial and residential rug and carpet cleaning at a competitive price tag. To get a 100 % free price offer in less than 2 hours, just call the expert customer care support or use the on-line form. This technique is suitable for natural and some synthetic elements and can remove oily and greasy stains from short and long fibers without leaving a trace. To effectively clean an affected and stained area of your rug or carpet, we hoover the area to remove any debris. This agitates the stain and will allow us to more quickly extract the dirt later on. Solids are removed and the area is pre-treated with a special cleaning agent which fits the chemical construction. It will help the hot water extraction procedure melt the stain and leave no trace. If the carpet allows it the stain is blotted so it better takes the detergent. Once done the cleaners employ a special hot water extractor which blasts the spot with hot water while at the same time drawing all of the filth and 95% of the moisture out. The pressure and heat of the process, put together with the pre-treatment take out 99% of the stains with full stain removal if it’s relatively new. Old and set stains are almost impossible to be totally removed, so acting quickly when the stain occurs is paramount to its proper extraction. There is some remaining moisture from the method, which will disappear safely within 3-4 hours, even fewer if you book our air movers. Go ahead and book your carpet cleaning services, right now, to ensure the air in your office or home is clean and safe. There are lots of different carpet and rug types out there and we’ve ensured to be able to clean them all properly. Our specialists use a different technique for all different kinds, which allows us to properly and safely clean both natural and synthetic fibres. We can clean synthetic, wool, cotton, linen, organic fiber, viscose, silk, chenille, plush, suede, leather, acrylic, leather, nubuck. With years we’ve been able to improve our stain removal methods to a science allowing us to remove not only oily stains, paint, rust, blood, tea, coffee, vomit, wine and moth damage, but also cope with synthetic and organic stains. The most effective deep cleaning for carpets and rugs is the wet deep carpet cleaning or the hot water extraction carpet cleaning from Quality Property Care Ltd.. 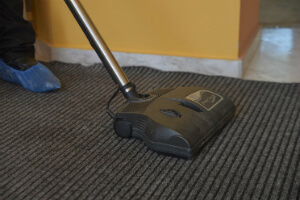 It includes pre-treatment of the carpet by hoovering with specialized vacuum cleaners, and then carpet stain and spot removal, followed by the steam carpet cleaning. The prepared cleaners perform a high quality shampoo carpet cleaning, using certified and safe cleaning solutions, which will not cause harm to you, your kids or your pets. 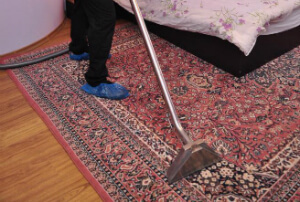 The rug or carpet will have as much of the water extracted from it, so it will need only 2 hours to fully dry off. If you ask for it, the cleaners can perform a very nice deodorising of your rugs and carpets for an added fresh and clean effect. There are some carpets and rugs which can't safely be cleaned with water, so the cleaners will deliver a very efficient and safe dry foam carpet cleaning. The unique and perfectly safe foam is sprayed and rubbed into the carpet or rug, and after it has done its cleaning work, it is extracted with the suitable tools and vacuum cleaners. The same can be done with your mattresses, curtains or draperies and blinds. Dry carpet cleaning needs no drying time, so you can step on your carpet or rug immediately after the cleaners are done. Dear customers, do not think twice to call us, if you have any questions or need of more additional information. Our carpet cleaning client support representatives will respond to you as soon as possible! For direct online reservations, use the booking form on our web site. Get a totally free quote via this phone number: 0161 823 0325! Our friendly and decent carpet cleaning company in Sedgeley Park M25 is waiting around for your calls!